Bithumb is a Korea-based cryptocurrency exchange that offers 36 crypto assets, but its sign-up process is very buggy, leading to a poor customer experience for new registrants. Its web and mobile app are rich with features, but take time to navigate due to the complexity of the layout. Founded in January 2013, Bithumb is one of the oldest and largest exchanges in South Korea, and part of BTC KoreaCom Corporation (BTCKorea). The brokerage offers 36 crypto assets and its own Bithumb cash as incentives for its users. As a member of the self-regulatory Korea Blockchain Association, Bithumb must adhere to the guidelines introduced by Korea’s Financial Services Commission (FSC) on July 1, 2018, related to information sharing, enhanced customer due diligence (EDD), and money-laundering (AML) requirements. Like many crypto exchanges, the broker incurred losses from hacker thieves (in mid-2018), but subsequently reimbursed affected clients. It now maintains up to six billion Korean won (KRW) in comprehensive cyber insurance coverage, with three billion KRW from Hyundai Insurance, and three billion KRW in personal leakage liability insurance from Heungkuk Fire & Marine Insurance Company. Since the recent breach, the broker has enhanced its security measures and remains one of the top venues for certain pairs such as the bitcoin Korean won pair (BTC/KRW) and ripple Korean won (XRP/KRW). Bithumb provides a web app and mobile trading platform as well as research-related content on its Bithumb Café page, and a block explorer on its Bithumb.info page. Trading with a crypto broker that traders can trust is crucial to success. 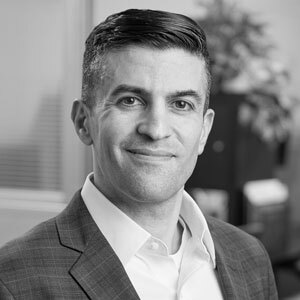 Unfortunately, crypto fraud and scams are common in the industry. To help investors select a trustworthy exchange, we have created a proprietary 1-100 score (the higher the better) of overall trustworthiness, which we call the Trust Score. Here is our trust summary for Bithumb . The following table summarizes the different investment products available to Bithumb clients. The commissions at Bithumb start at 0.15% for makers and takers (makers are those who create orders that subsequently get taken by takers, and takers are those whose existing orders get hit by new orders from makers). The broker also offers a fixed discount via a coupon it sells, where fees drop from 0.075% to as low as 0.010%, [although it was not clear what the process is to purchase the discount coupon and what the all-in cost that a coupon holder would incur to realize the commission discount. Bithumb does note that such discount coupons are given every noon to active traders based on their trailing 30-day volumes, but expire 30 days thereafter. Bithumb offers a hosted wallet solution whereby users can enable Two-Factor Authentication (2FA) security using Google Authenticator. However, this requires the Bithumb mobile app to be installed and synchronized, and since the app isn’t fully translated into English, it is not a viable option for all users. I did manage to sync the Google Authenticator app with the Bithumb login, which also requires an SMS and security pin to enable it. It’s worth noting that the SMS doesn’t always arrive immediately. The broker also includes email verification when carrying out basic operations such as logging in and transfers to help increase security, provided a user’s own credentials have not been compromised externally (i.e., a hacked Gmail account, phone, or other ways in which a user’s login credentials could be compromised will make any broker’s security methods ineffective, and thus users must always exercise great caution in protecting their personal information). I noticed that the broker doesn’t permit passwords longer than 12 characters and has strict requirements for combinations, including case and special characters. This could be inconvenient for those wishing to use longer (more secure) passwords. However, the broker also requires a pin security code, which is used as an additional authentication method entered after the password prompt. Finally, Bithumb provides a security software system from Ahn Lab, compatible with Windows computers, as part of its intrusion prevention system. Clients may download and install this software. 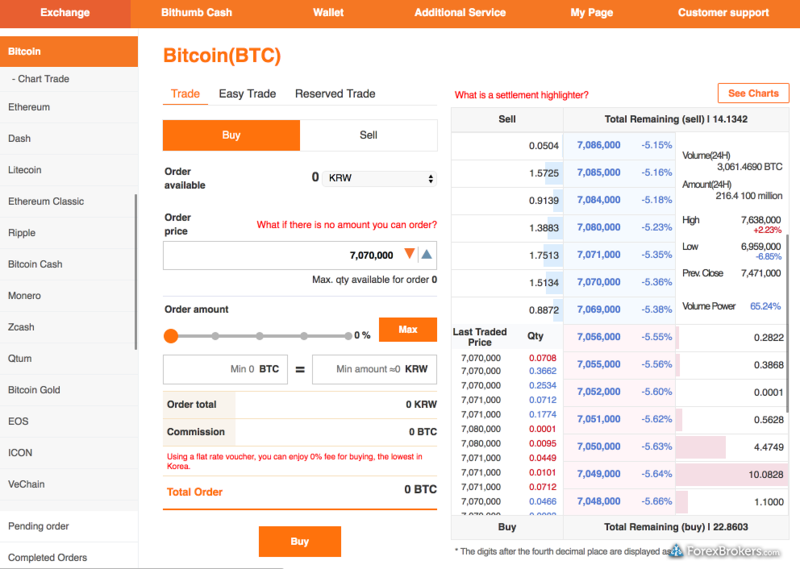 Bithumb’s web platform is integrated into its website and provides a combined order book and trade ticket section, with three order types available. 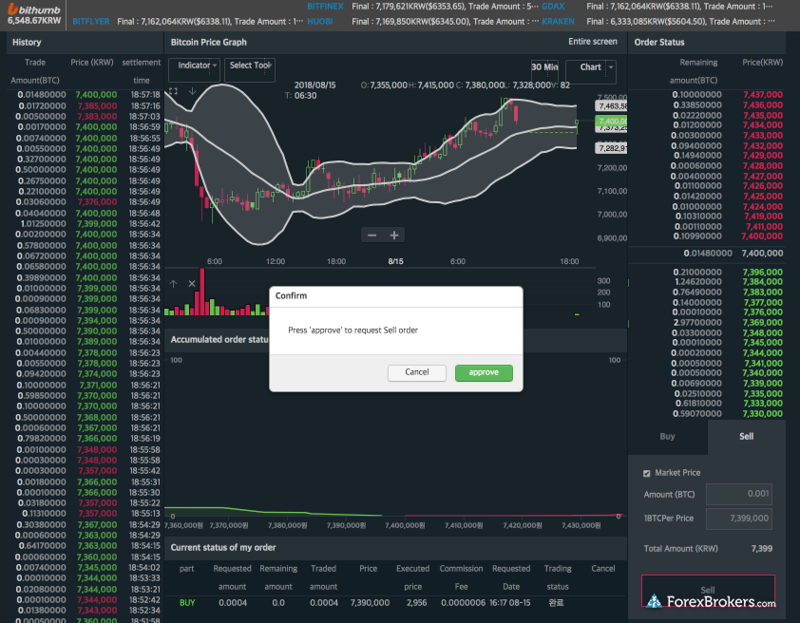 Available crypto assets are listed on the left side of the screen, but no watch list functions are available, and the same goes for the exchange section upon logging in to the web app. After a crypto asset has been selected, the platform switches to trading mode, where a trade ticket (order dialogue) window and order book are displayed as a depth chart, but charts are segmented away (more on that below). The depth chart displaying the order book was busy with details such as recent volume-related statistics, and was scrollable vertically, although there were no parameters to adjust the appearance of the depth chart. Not a big deal, but some users may want to customize the depth chart, such as choosing the number of decimal places to show. 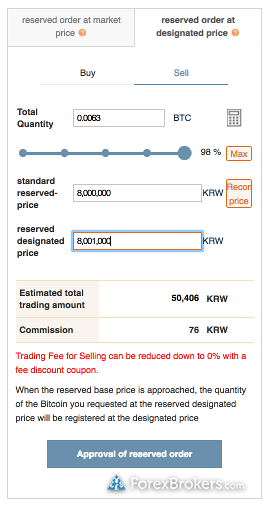 Creating a simple buy order was very easy, thanks to Bithumb’s trade ticket design, which includes a sliding bar indicating the amount available, a feature other brokers such as Binance offer. The reserved order, which creates a pending order, was also easy to figure out, although how to find it afterwards was not immediately clear, as there is a separate section for reserved pending orders. Overall, the trading functionality was on par with other crypto exchanges. The charts in Bithumb’s web platform, segmented away from trading, are powered by TradingView, which is loaded by default with nearly 100 studies and several drawing tools. 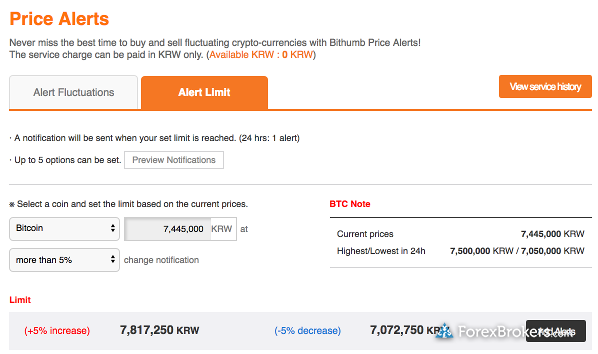 Bithumb offers price alerts for specific price levels, as well as price fluctuations for specific % changes, both useful features for traders, although both are segmented away. It would be better for these price-related features to be very close to each crypto asset so users can add them quickly, for example, from the list of crypto assets seen after logging in. 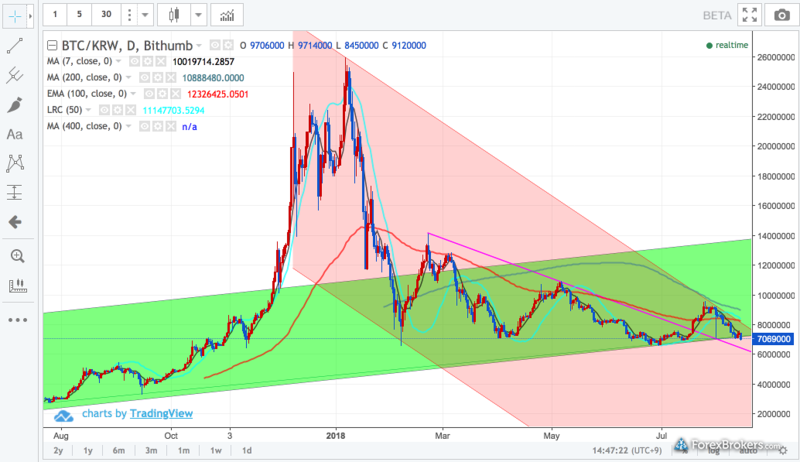 One thing I found odd, and I’m not sure how the window appeared, was the Bithumb tradeview window, which looks like a more advanced section for users to analyze prices and place orders. Overall, I was pleased with the Bithumb user interface, even though it took some time to find everything. However, there is room for improving some features, such as integrating a favorites list (watch list). The mobile app for Bithumb is available for Android and iOS devices. For this review, I used the Android version running on my Samsung Galaxy S8+ device. Logging into the app was a bit cumbersome as the default language is Korean, and navigating to the login screen and changing the language to English was not easy, as the platform defaults to a demo mode, not the login screen. 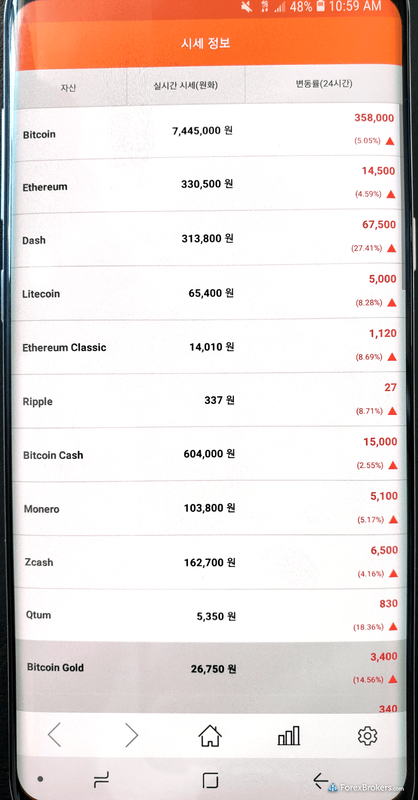 Like many mobile apps from crypto exchanges and mobile wallets that have recently updated their security policies to prevent screenshots and mitigate related cyber security risks, I was unable to take screenshots of the Bithumb app from the device. 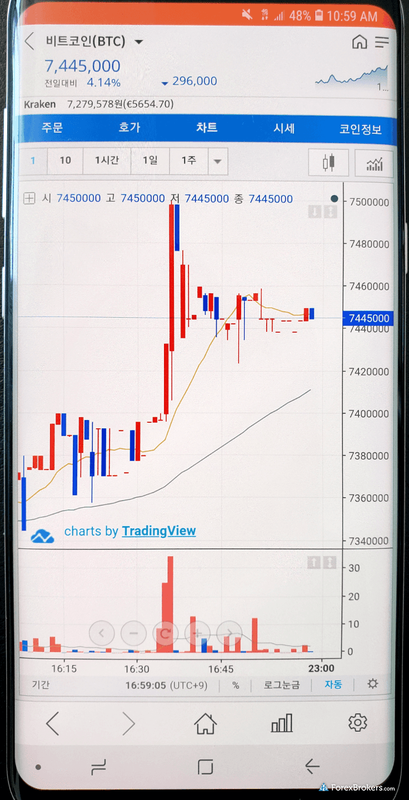 Like the broker’s web application, the mobile app has charts powered by Trading View, and Bithumb provides a ticker that shows the prices of some competitors such as Huobi, Bitfinex, GDAX (Coinbase Pro) and others, so users can compare. 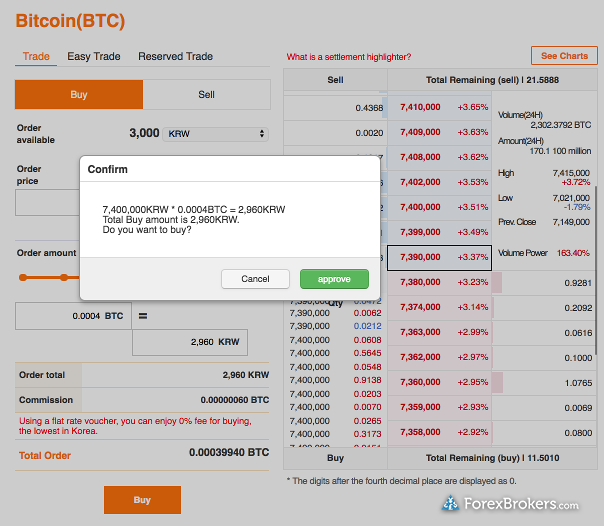 Clicking on the coin info section reveals detailed explanations of the crypto asset selected. However, even with the language set to English, the text is still in Korean, so clearly, like the web app and broker’s website, not all the features on Bithumb’s mobile app have been fully translated. Bithumb Cash is an internal crypto currency Bithumb offers as a reward for users who deposit funds into a live account. 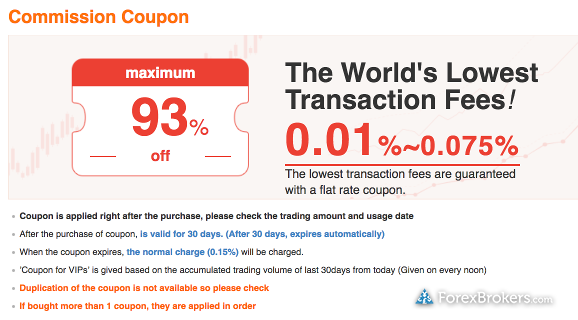 For example, during this review, I received 3,000 Korean won (KRW) worth of Bithumb Cash, equivalent to roughly $2.65. It’s also worth noting that the broker will display your balance equivalents in a variety of formats including USD and KRW, and many of its crypto assets, such as bitcoin, are priced against the KRW (i.e., BTC/KRW). Due to the differences in conversion rates between the USD/KRW, many crypto assets priced in KRW have been used by traders to capture potential arbitrage opportunities when selling crypto assets at a premium (i.e., a higher price than those offered elsewhere). Coinbase is another such example where certain crypto assets traded at a premium, compared to Bitstamp, where they could be acquired at a discount. However, realizing such gains can be challenging when users are left with Korean won and no means to repatriate those funds except by buying back crypto or other fiat currency (which sell at a premium, potentially offsetting any realized gains). While Bithumb’s offering is rich with features, its initial login and user experience is poor, and takes a lot of trial and error to eventually access the many resources that are nestled away and not in plain site from the main trading windows on its platform. The initial login experience was also very problematic for me, despite multiple password resets and attempts to login with correct information. This remains an area in which the broker has considerable room for improvement, despite recent attempts to improve its processes and security. Overall, Bithumb’s web app and mobile app are robust yet the lack of fully translated English content is likely to disadvantage non-Korean speakers. We do expect these areas to improve, but until then, Bithumb’s offering has a few shortcomings that drag down its ranking among its peers. In addition, while Bithumb remains a top choice for arbitragers and traders looking to sell crypto assets at a premium, due to the price differences with many Western exchanges, the broker’s lack of non-KRW pairs makes it harder for traders who transact with other fiat currencies to achieve gains. 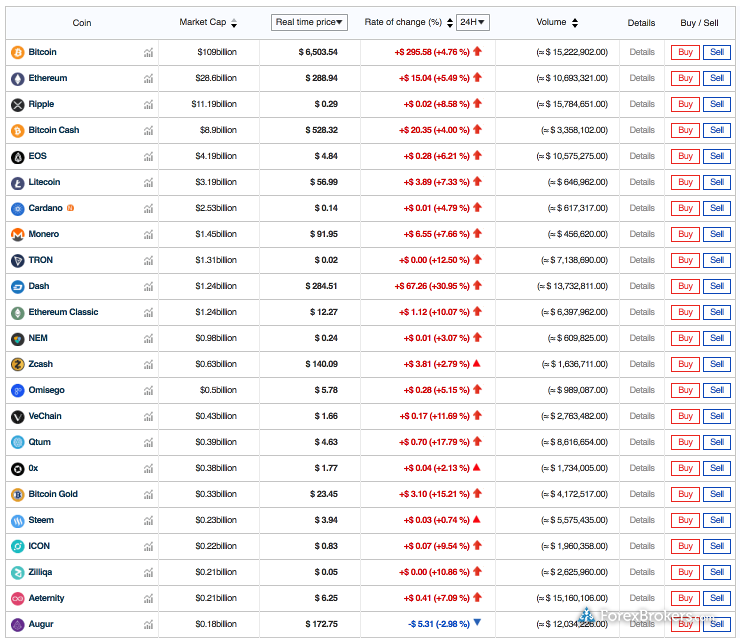 Select one or more of these brokers to compare against Bithumb. Find out how Bithumb stacks up against other brokers.